Enjoying the emptiness of the highways (we did this several times while driving across the country: there were a lot of empty roads!). Like a lot of former British colonies, when driving in South Africa, you’ll drive on the left hand side of the road. If, unlike me, you’re coming from a part of the world where you drive on the right hand side of the road, this will seem pretty bizarre at first. If you pick up an automatic vehicle it’ll be a bit easier, as that’s just one thing less you need to think about. When we were there, we drove a manual transmission car. If you’re unused to driving on the left you’ll probably find it the most difficult in the situations where your natural instincts handle everything. Changing gears whilst going around a round-about or turning a corner your instinct will probably to change with the wrong hand, so you’ll have to consciously remind yourself of that. Out in the countryside, it’ll also be helpful to make a habit of reminding yourself to stick to the left when you pull out of your parking spot; traffic is often a good reminder of where you should be, and out in the country you might not have that to rely on! Also, get used to thinking you’re about to indicate your turn and instead accidentally turning on the windscreen wipers. It’ll likely happen more than once! While we didn’t come across anything too hairy. South Africa has a reputation for poor road safety. This usually takes the form of drunk drivers, reckless driving, and unroadworthy vehicles. Pay attention, and take all the regular precautions when driving. Check the AA link (this is the equivalent of the AAA for our North American readers) for some specifics. In addition to this, driving in South Africa has the additional danger of carjacking. Again, this is something we didn’t experience personally, and the statistics indicate most of these occur in the Gauteng and Western Cape provinces (home to Johannesburg and Cape Town respectively). Always lock your car while you’re driving. Keep your windows up when in populated areas. Be aware of pedestrians and other motorists when you pull up to a red light. Try to leave yourself room to move so that you’re never boxed in. Never keep any valuables in the car, if you can help it. If you must, keep them out of sight. Plan your route to stick to main roads, and avoid lesser used side and back roads. Keep your phone out of sight if you’re using it for navigation. At night, park in secure parking or well lit areas. If you have a choice, get a white car. White cars are very very common here, probably due to the harshness of the sun, and by getting a different color you’ll stick out a little more. That said, we had a red SUV and didn’t run into trouble. Lots of white cars in Cape Town. In the cities and towns, close to popular attractions and the popular restaurant and bar strips, you’ll often find car watchers. These guys are identified by their fluorescent vests. Car watchers will often direct you to an empty parking spot, or at least come over to make sure you’re aware that they’re there after you’ve parked. If you want to make extra care that they watch your car carefully, you can give then a bit of a tip right then, but it’s more common to give R5-20 ($0.40-1.50 USD) when you come back for your car. A word of warning about car guards: They are essentially self-employed, and anyone who can get together the cash for a vest can claim a corner. If you notice the car guard has a particularly shabby vest, and generally looks a little sketchy, move along and try somewhere else. You’ll find most rental cars in South Africa are manual transmission, though for a higher price you can find automatics. You can get by with a regular 2-wheel drive car, but might find yourself on some pretty bumpy and uncomfortable roads. An SUV is a much safer bet, or you could go all out and get a real rough-and-tumble 4×4. 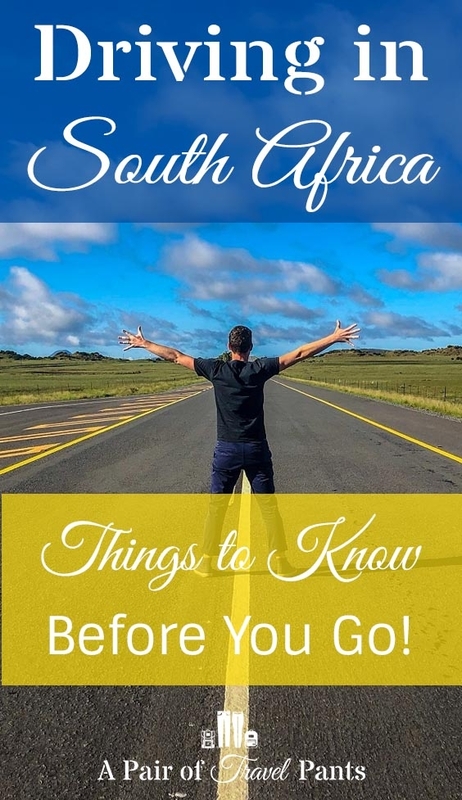 South Africa is a spacious and relatively young country, so you usually won’t find the same small and winding roads that you might in Europe. 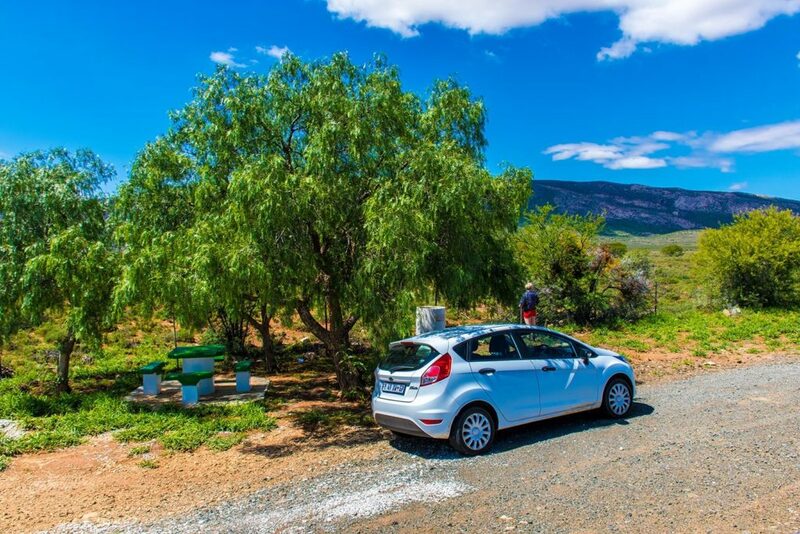 We started off our Southern Africa road trip with a small two wheel drive ford fiesta. For driving in South Africa, this was fine, however we did encounter bumpy and uncomfortable roads at times. After some car trouble in Namibia (check back later for our post on driving in Namibia) we ended up trading in for an SUV, so finished off the loop back to Johannesburg airport in that. 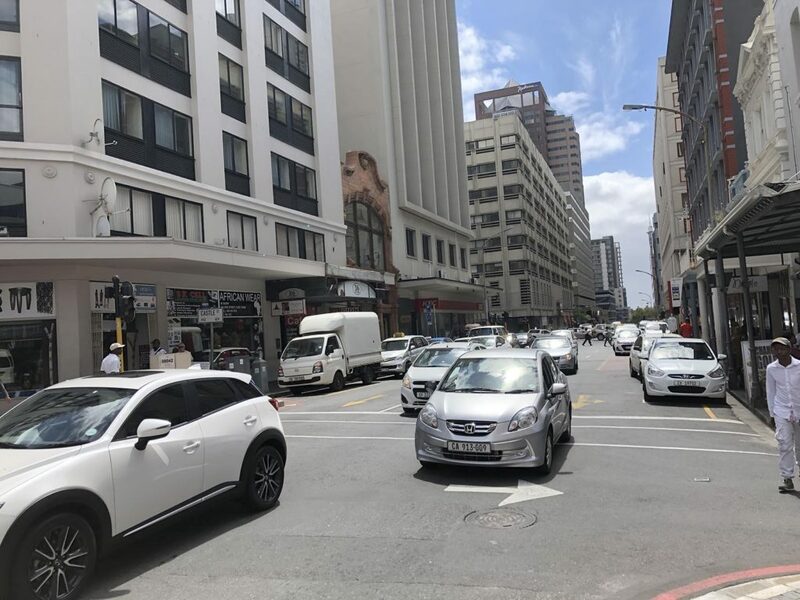 The smaller car was perfectly fine for the majority on South Africa, and if you are planning on flying in and out of Cape Town and only exploring the immediate vicinity of this area, plus a bit of the garden route, this will be a fine (and cheap) option. If you’d like to self drive a few safaris, and go off the beaten track a little more, stick with an SUV. Be aware of the usual pitfalls when renting a car (taxes, insurance, additional driver fees etc). In addition to this, you’ll find that there are extra fees for border crossings. These border crossing fees apply to entry into most neighboring countries (Namibia, Botswana, Zimbabwe, etc. ), and apply when travelling between these countries even if you don’t return to South Africa (we needed to pay for the border crossing pass to go between Namibia and Botswana. Reentry back into South Africa doesn’t incur an extra cost. It was pretty expensive for each one (around $150 USD), so bare that in mind if you’re only planning a day trip into a neighboring country. 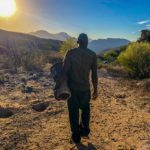 While in Botswana, we planned for a day trip to Victoria Falls, and ended up paying for a tour to take us from our campsite in Botswana. The tour cost us roughly $80 USD, which is significantly less than the cross border fee our rental car company would have charged us. 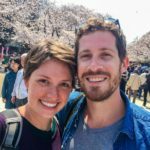 In addition to this cross-border fees, we ran into trouble with our rental car company because they were only able to issue rentals for a maximum of one month. We had booked with them for two, so they informed us that we’d need to contact them when the first rental period ended so that they could record the new car mileage and issue another booking period. 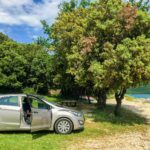 We did our best to do this, but due to lack of mobile coverage and internet access, they only received the mileage numbers a few days after the rental period ended, so charged us a frustrating late return fee, despite the fact that they knew we were going to have the car for two months! It was all sorted out when we got back, but it was an additional stress which really wasn’t necessary. Just keep this in mind if you are going to rent from a smaller car rental agency. We’d recommend looking into a more international company that has branches in neighboring countries around South Africa if you plan to leave the country. This is main hub for flights in and out of South Africa. O. R. Tambo International Airport (JNB) is well serviced with international flights, and has a large selection of rental car companies right outside the airport. 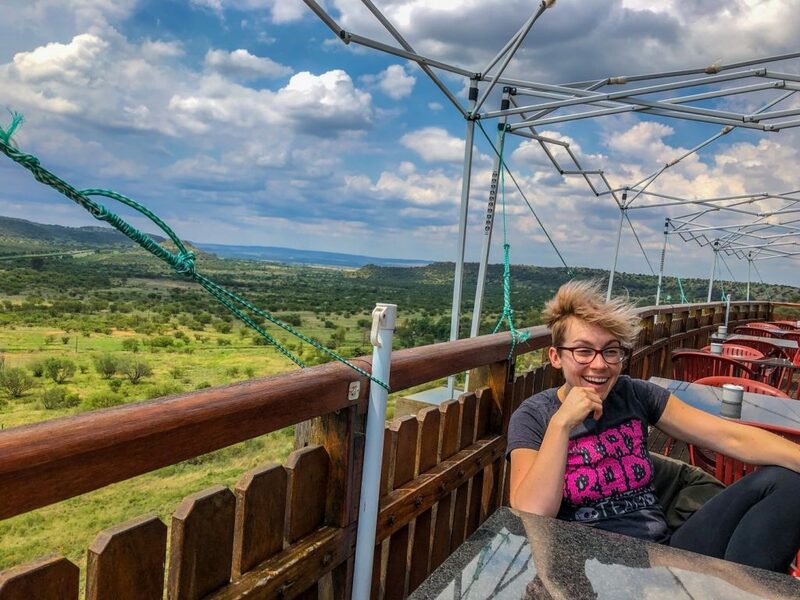 From here, you’ll be about 30-60 minutes from many parts of Johannesburg and Pretoria, and in a good spot to make a start on your southern Africa road trip. 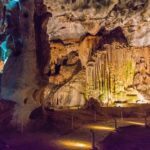 From J’Burg, you can either head north into the Limpopo province, south towards the Wild Coast, or south-west towards Bloemfontein, Cape Town, the garden route and much more. At one point, Natalie read out the next navigation instructions… “Are you sure?!”. What followed was about an hour of driving over a mountain pass, on bumpy and rocky dirt roads. Another big travel spot, with an airport to match (CPT). Cape Town is a destination in and of itself, so there’s plenty to see and do. 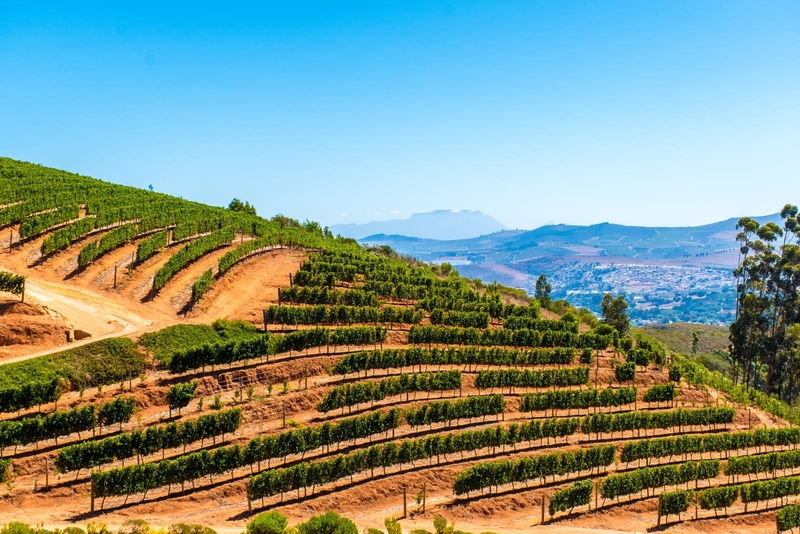 It’s also located right near the hub of the South African wine region, and at the tip of the Garden Route, so you have the option of either treating yourself to the deliciousness which is South African wine, or exploring the beauty of the southern coast. We loved having a car for the 5 or so days we were here. 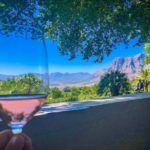 So much of Cape Town was only within 15-20 minutes drive from where we were staying in Bo Kaap, and the wine region is only an hour away, so is perfect for a day trip (so long as you can resist sampling all of the wine you see!). 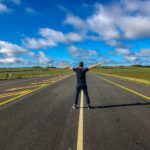 We unfortunately didn’t make it to this corner of South Africa, but we met many South African locals who recommended the Wild Coast as another beautiful part of the country to road trip in. King Shaka Airport (DUR) has a few direct international flights, but you’ll probably find yourself having to transit here from elsewhere. From Durban, the Wild Coast is yours for the taking. You could either head south west towards Port Elizabeth (with Cape Town as an eventual destination? ), or perhaps take a peek into Lesotho or Swaziland (these two countries are often exempt from the regular cross boarder fees that rental car companies charge!). 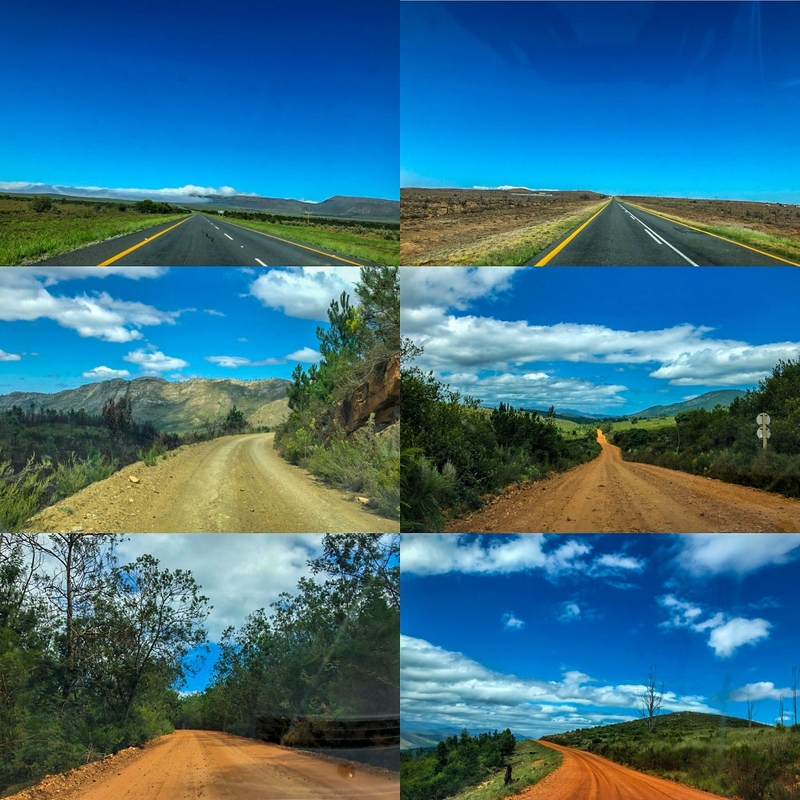 With the exception of some of the rougher mountain passes and corrugated dirt roads, the roads in South Africa were pretty excellent. There is A LOT of investing in road infrastructure going on here, and we lost track of the number of road construction projects we passed by. Many of the toll roads in South Africa are automated, so you’ll likely be billed for these by your rental company. However, there are some that require you to pay as you go. There’s no guarantee that these will take credit cards, so it’s best to keep some cash with you at all times. If you don’t use it for this, you’ll use it on tips later. You’ll probably find driving on the highways to be a delight. They’re well maintained and spacious. It was here we first encountered South African road etiquette. I think overall, South African drivers were some of the most considerate drivers I’ve come across. Most of the highways have very wide shoulders. Wide enough for it to almost be an additional lane. Slower cars and trucks will often pull half way (or all the way) into the shoulder, to allow faster traffic behind them to pass safely. It’s common to flash your hazards in thanks as you pass, and you’ll often be rewarded by a bit of a light show from the person you’re passing (especially if they’re a trucker). If you happen to be the slow car in question, the driver behind you will often flash their high-beams a few times, or flash their hazard lights, to indicate they’d like to pass. At this point, you’ll pull into the shoulder, and they’ll happily (and safely) pass you. Finally, similar to a lot of other countries, if you see an oncoming car flash their high beams at you, it’s probably to warn you of an upcoming accident, speed trap, or police check. Driving in South Africa, you’ll find petrol stations pretty easily and often, especially along the main highways. That said, it’s wise to fuel up when you can. This is a big country, and the last thing you want is to run out. Petrol stations in South Africa are a delight. They are full service service stations as you’ve never seen before. The attendant will fill you up (just tell them what you want, and how much), but they won’t stop there! Clean your windscreen (front and rear)? Sure thing, they’ll also clean your headlights while they’re at it! Need your tire pressure checked? No problem. Want to check your oil levels? They’ll do that too. The price for all this? Zero. It’s customary to tip at petrol stations, and our rule of thumb was to tip a base amount of R5 (about $0.40 USD), and then add a few Rand for each additional service we required. It truly was luxury. We encountered a group of South Africans who were also road tripping around, and got talking about the petrol stations there. They had to admit that they’d never had to fuel up their own cars, ever! This was the view from a rest stop we pulled into to have lunch. Windy and gorgeous! We have our phones on a T-Mobile international plan, so in South Africa we had free 2G data. It was sufficient for navigating with Google Maps, though if you’re on this plan, expect to have periods where you won’t have any service. As I mentioned before, South Africa is a big, and mostly empty, country. As a back up, we’d also downloaded the offline South Africa map for the MapFactor Navigator app. Between the two of these we were pretty sorted. 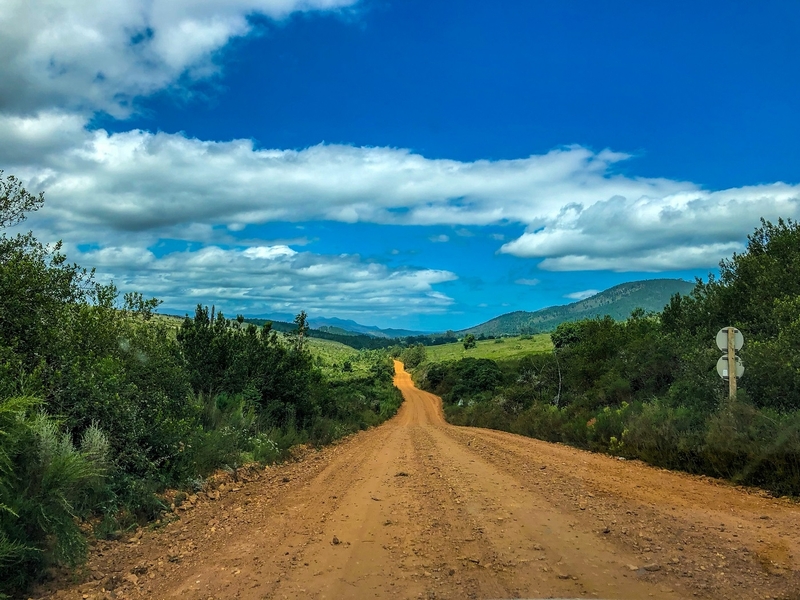 A word of warning however: Sometimes what look to be pretty main routes will sometimes turn from a nice paved road, into a dirt road that takes you through a mountain pass… that can be a real annoyance on your Southern Africa road trip. Keep an eye out for this sign. It means that the buttery road you’re currently driving on is about to get dirty. This skirts you along the coast, and then around the Kogelberg Nature Reserve on your way to Cape Town. 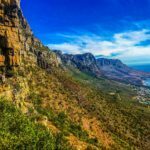 You’ll be able to stop off at the penguin colony at the Stony Point Nature Reserve, and you’ll likely want to stop and take in the sights as you head north around Kogelberg. This one was a bit of a long drive, but a beautiful one. 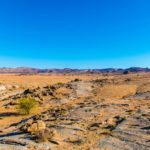 After leaving Cradock, you could make a side trip to Nieu-Bethesda, or maybe a hike in the Valley of Desolation as you pass through Graaff-Reinet? 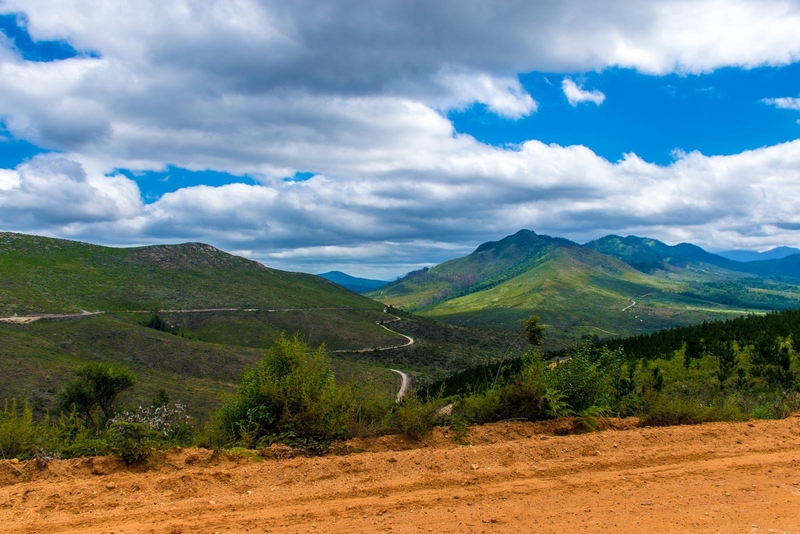 It was during this route that we first encountered our nicely paved road disappearing out from under us, turning into a bumpy dirt road as we approached Prince Alfred’s Pass. We did this in a two wheel drive car (and weren’t the only ones), but an SUV would have definitely made it more comfortable. This is a particularly beautiful stretch of the N2 highway between the Western and Eastern Cape provinces. It is full of verdant forests, beautiful beaches, stunning gorges, and epic coastline. We took a hike at the Tsitsikamma end, the Strip Tease Trail, which was beautiful, uncrowded, and a lot of fun! We’d love to come back here again. If you’re looking for more route suggestions, check out this post over on Rough Guides. We were chosen for a spot check once, on our first day out of Johannesburg. It was a little more lackadaisical that other police checks. “Is that a person on the highway?”… “Oh, it’s a cop… hang on, they’re waving us over…”. After a quick check of my drivers license, we were moved along. 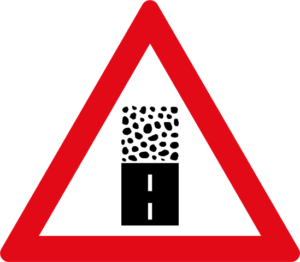 I mentioned earlier that South Africa is undergoing plenty of road construction, so expect to be stopped at some of these. Often they’ll be working on a long stretch of one side of a two way road. This means they’ll block off the remaining side, and alternate traffic along it. Sometimes this is only a couple of minutes wait, but we had to wait about 15 minutes at one point over a long stretch of construction work which was slowed down by a multitude of big and slow trucks. It’s all very organised, however. In one road trip, we came across all these different roads. 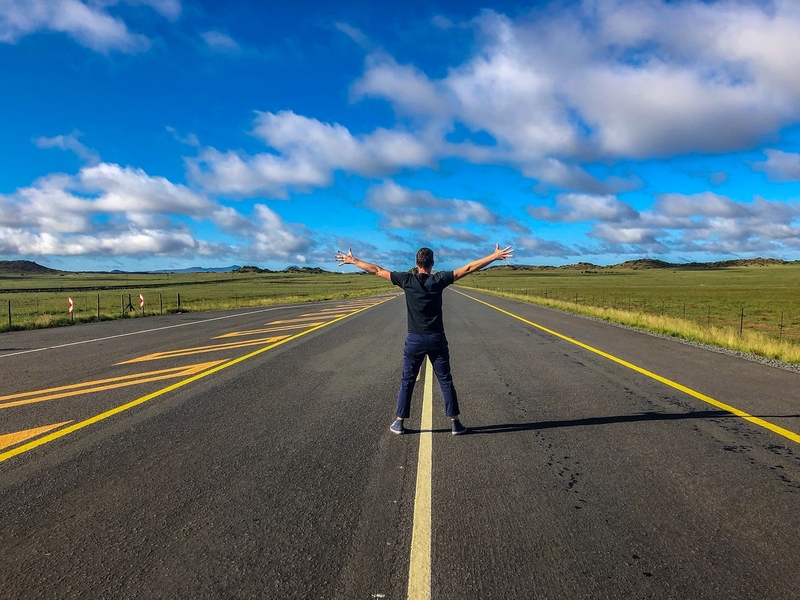 Overall, driving in South Africa was one of our most surprising road tripping experiences! We didn’t anticipate the epic vastness and emptiness which we encountered, nor the variety of landscapes and views. From the dry and flat Karoo, the lush wine country, the mountains and the coastline. South Africa has a little bit of everything. Not to mention the hip and happening cosmopolitan cities! 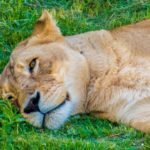 During our 2-month Southern Africa road trip, we spent about 3 weeks of that driving in South Africa. We absolutely could have done more, and left with a larger list of things to see than we arrived with! If we were to go back, we’d plan to spend more time along the Garden Route, and head out to the Wild Coast. Driven in South Africa? Feel like we’ve missed something? Let us know in the comments!